I'm not sure wether making a game out of a B-movie idea results in a B-game... but I'm aplying some Ed Wood's way of doing things (as in Tim Burton's Ed Wood) here: do not care about details, it's the global thing that matters. Ok, I knew about this competition around the 18th of August. I decided to enter although there is no much time left, with an adaptation of an idea of a friend of mine. What is worse, this week I'll be on holydays with my girlfriend in a hotel. Well, that's not bad, obviously, but I won't be able to code a single line. But this last week I managed to get something working and I think I'll be able to finish a game-like thing for the 13th of September. Synopsis: Six friends rent a hut by the lake, up in the mountains, looking for a wild weekend party. But there's a reason why the rent is so cheap... Those are your hunting grounds! 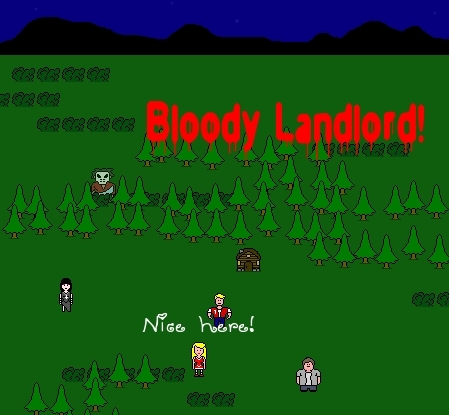 You play the maniac landlord and the objective is simple: get the maximum amount of terror from those pervert teenagers. Scare them! Hunt them down! Kill them slowly, make them suffer, or simply behead them! - Controlable maniac (movement and attack), which includes hidding in the woods and bushes. - Partying teenagers, quite talkative. It will be difficult, but I hope I'll have enough time Good luck to those entering the competition! I'll be here again next saturday! This actually sounds quite cool. Especially the way you scare people. I think that big ideas and limited time for implementing/bug-testing them properly may be a great way to make a B-game. I love your cast of stereotypes, btw. Well, here I am sooner than I expected. Thanks for those comments! Cheerleader, Captain, Gothic, Nerd, Hippie and Bigboy. Those are their instance names in the code I'm not yet sure about the maniak's mask. The current one is just Jason's, but I'll probably change it. And there will probably be a sheriff. I have no time for animations, so they'll move a little bit like south park characters... But they do talk a lot! There's quite a bunch of things they say depending on what they are doing (like 'Please, don't kill me!') Next milestone: tag game! Get the victim before it reaches the hut! You don't have to make new sprites for the tripped victems. Just rotate your current ones 90 degrees. I might be a good idea to have them trip randomly or randomly based on how athletic they are. Captain trips 5% of the time, Goth trips 20% of the time, Big boy.... well lets say he travels more by rolling. Big boy.... well lets say he travels more by rolling. :D Indeed, they do have different stats, like being more or less talkative, speeds and accelerations. I'll have a look at the rotozoom library. I think it's the proper way to rotate surfaces with SDL. Would the goth and fatso really get invited along to Camp Lots of Blood? Seems to me this whole adventure of theirs is either a 1980s teen comedy or a front for narcotics manufacture. Well, if you ever wanted to feel like Jason Voorhees, get a hockey mask and a machete and run through the closest forest, because this is not a simulator. Theres's a forest, yes, and a hut, ok, some guys partying, sure, and a madman with a scimitar and some kind of mask. But it's not a simulator. It's up to you to shout DIE DIE while you chase and kill the six teens! I never really think about it in real life either. I just start swinging until all the voices stop! They made fun of my baking a cake. It is a delicious cake. YOU MUST EAT IT. Yes! Finally killed them all! Great fun! I'm actually a little afraid how fun this was. following them around closely, trying to stay between them and the hut. stabbing them here or there just to make em bleed a little more. Trying to get one hit ambushes are fun too. Or just running at them with no stealth and watching them panic as you jump on them stabbing like 30 times till they are just a goopy puddle in the woods. 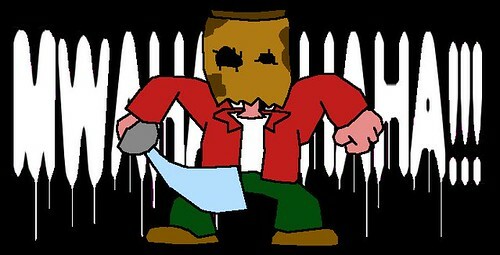 I usually don't like games this easy, but it adds to the feeling of being the superior psycho killer guy. Right up the part part where I get all cocky and lose to the last teenager. The laughing sounds as you stab are awesome.